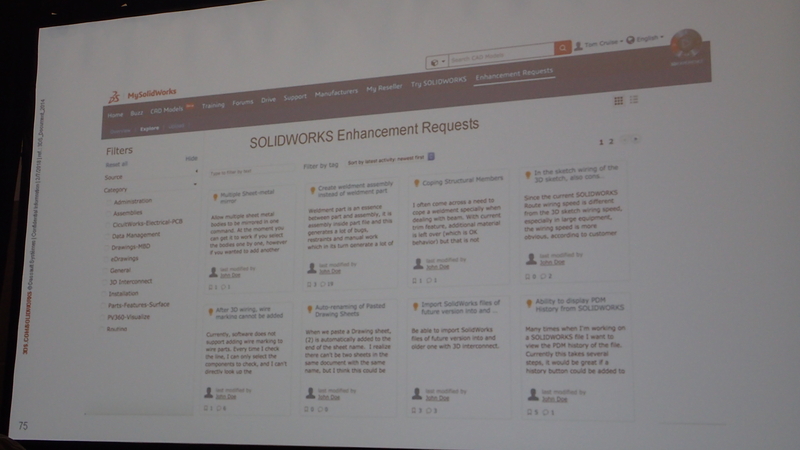 At SOLIDWORKS World 2018 once more saw the User submitted Top Ten enhancement requests was presented as a Breakout session. 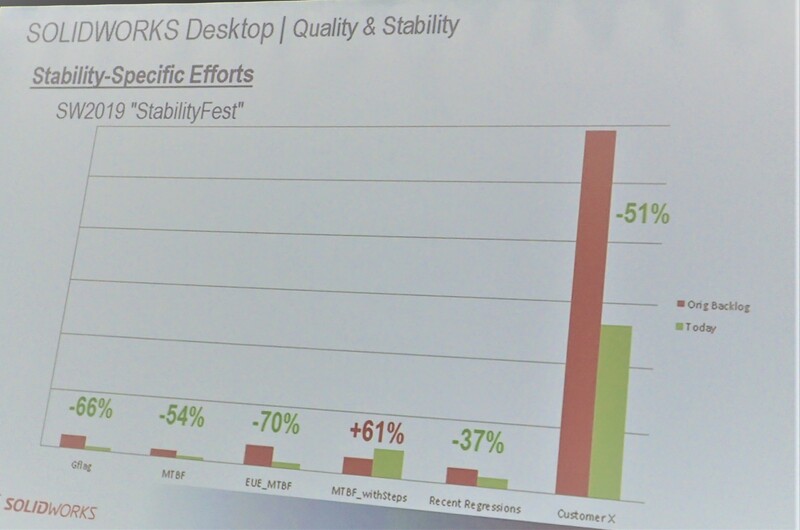 This continues on from last year, which first saw the Top Ten not presented on stage of the General Session. 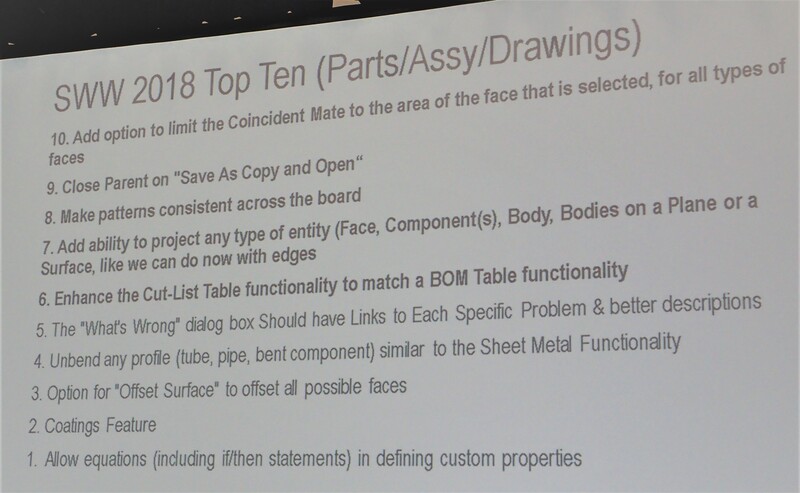 We know last year that there was a strong campaign in the Top Ten, driven by a post in the SOLIDWORK Forum, titled One and Two. There were a couple of main drivers behind the One and Two post, Rick Becker and Dennis Dohogne. 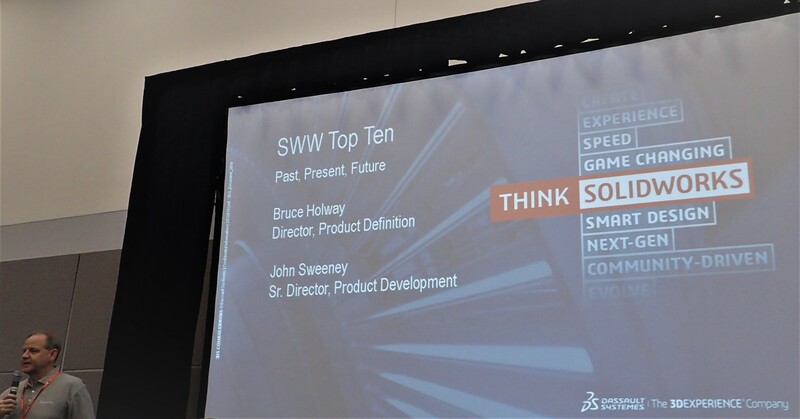 Both were at SOLIDWORKS World this year and were in attendance of the Top Ten Breakout session. I had the opportunity to finally meet both earlier in the week. Both great guys. 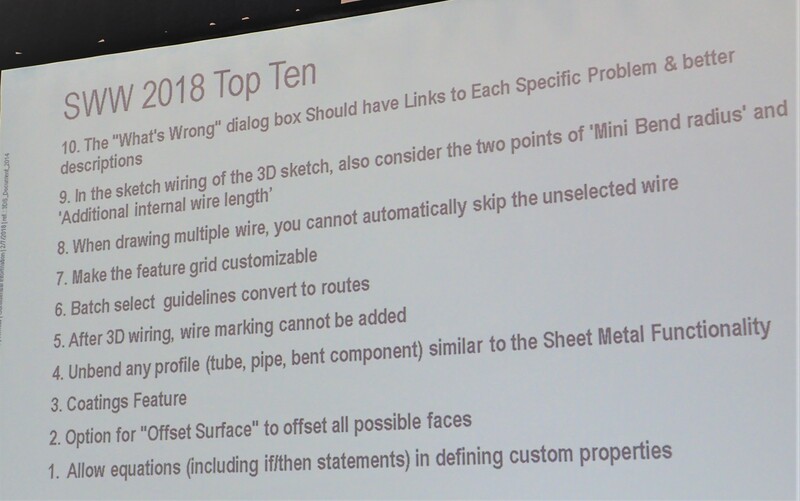 You can read Dennis thoughts on the Top Ten Session. 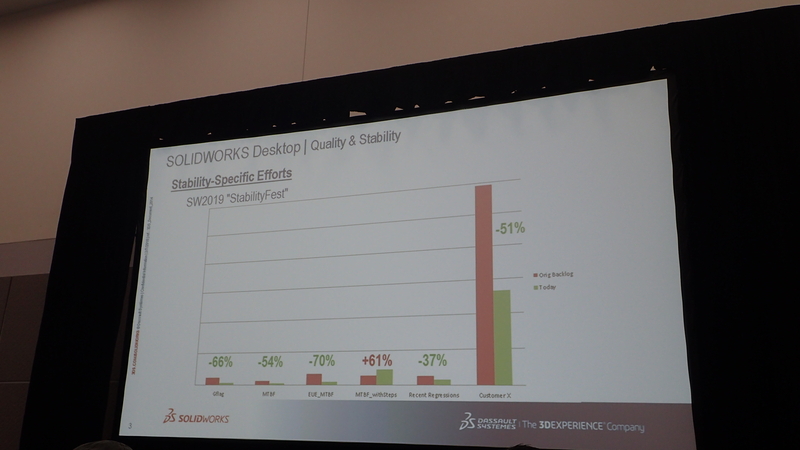 Despite the thoughts of some, Dassault Systemes SOLIDWORKS has not hidden from the criticism raised in regards to the Performance and Reliability of the product. In fact they appear to have embraced it and once more have addressed it in this session. Bruce then moved straight into this years voted Top Ten. 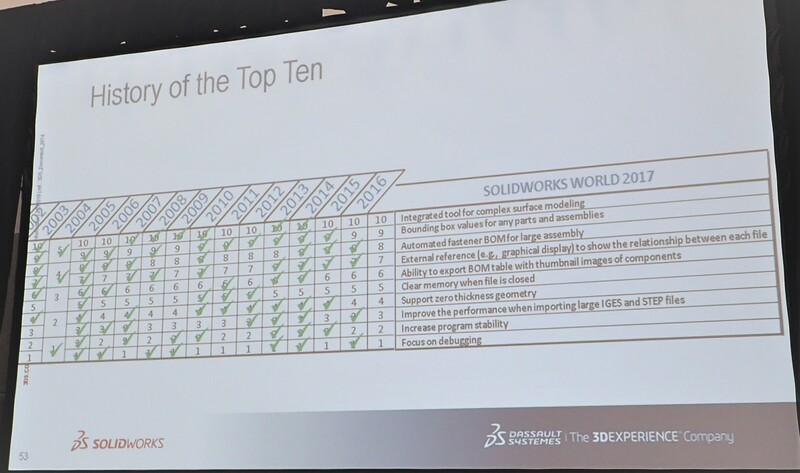 To allow development of the core components of the SOLIDWORKS product they have produced an adjusted Top Ten which concentrates on Pasts, Assemblies and Drawing. 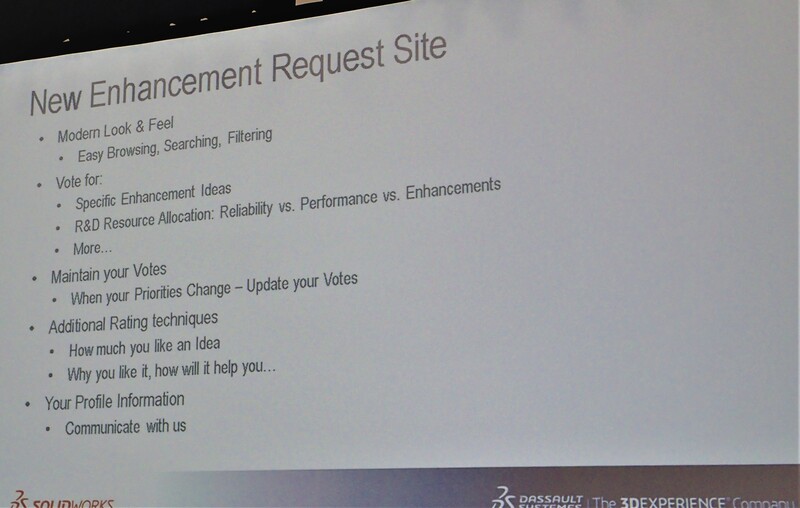 To do this the first four and the tenth have become the top five, with the next top five voted enhancements have been added to that list. 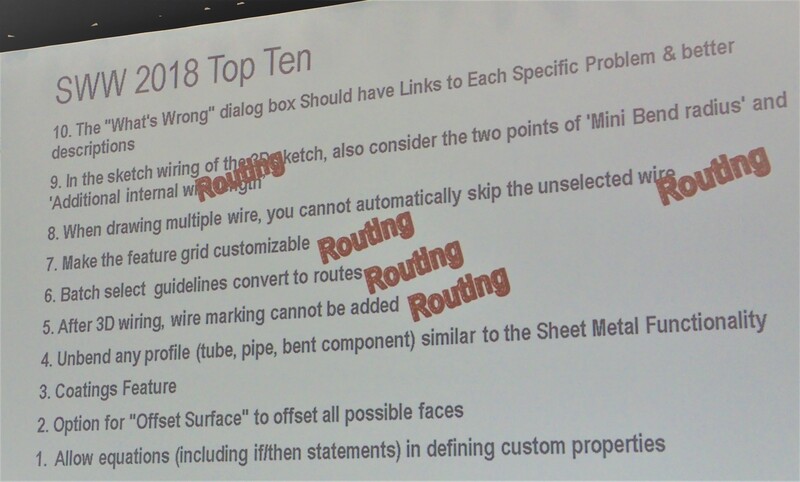 To give a Top Ten which looks like this. 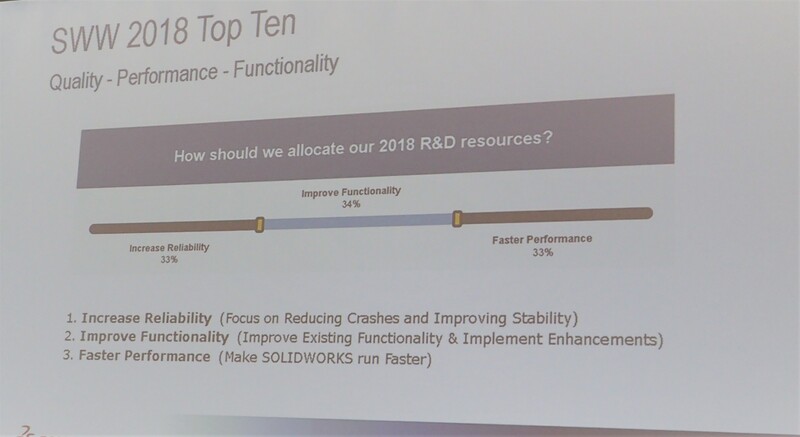 This year saw the Top Ten website introduce a sliding scale, to allow a voice in regards to how much R&D resources should be split between Increased Reliability, Improved Functionality and Faster Performance. An interesting note was that this wasn’t optional. 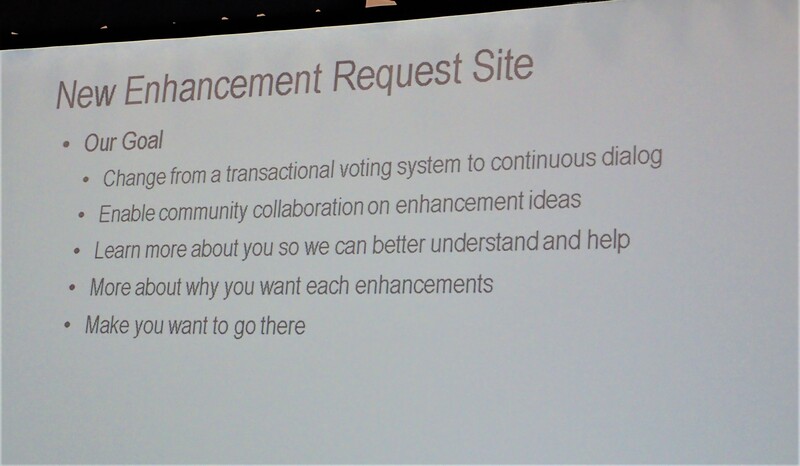 If you wanted to view & vote on the Enhancement requests then you first had to vote. 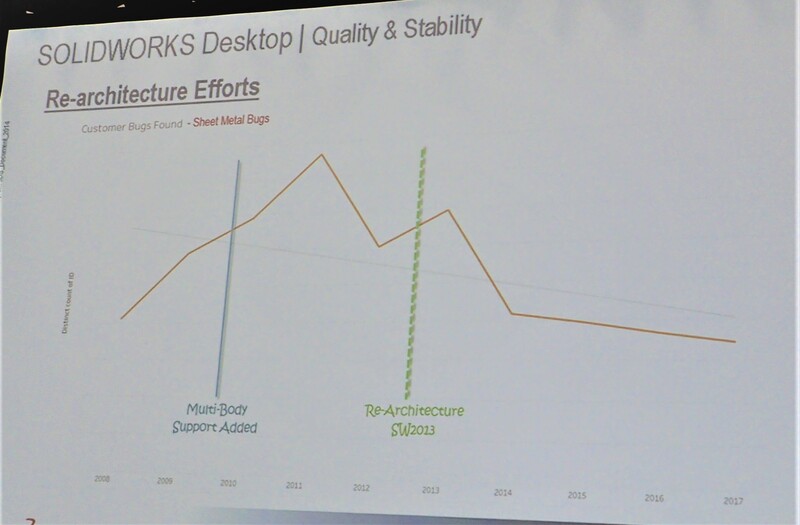 As I said earlier Dassault Systemes SOLIDWORKS has embraced the need to improve the software and has not shied away from it. As you can see Bruce was happy to enter into the spirit of the “One & Two” campaign by wearing the cap that appeared, Thanks to Rick Becker. 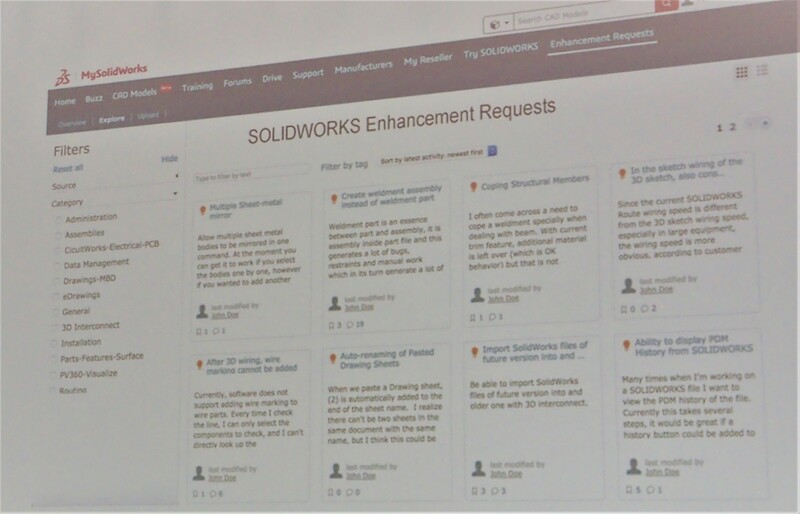 Bruce finished with some data and information on how Dassault Systemes SOLIDWORKS interacts with and receives it’s feedback from the community. 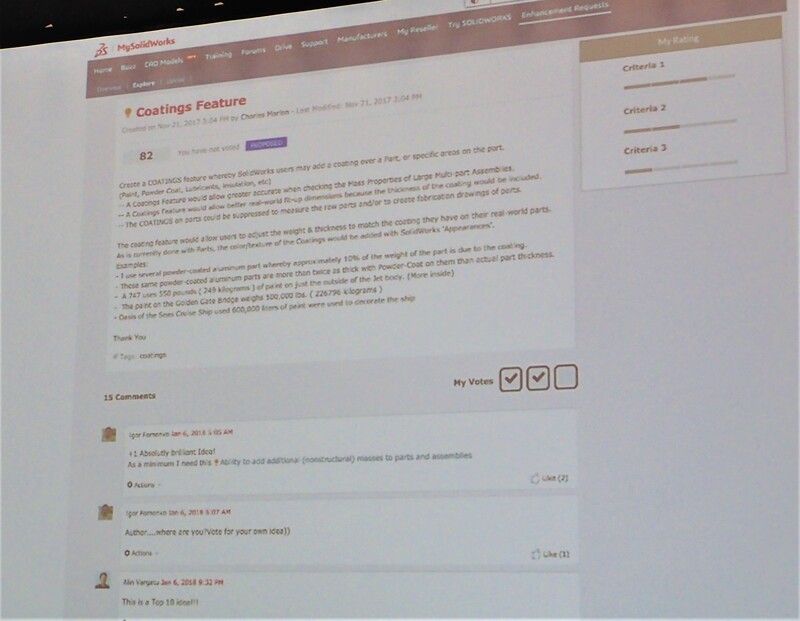 A good example of that is that I personally did four (4) Alpha & Usability testing over the Saturday & Sunday at this SOLIDWORKS World. 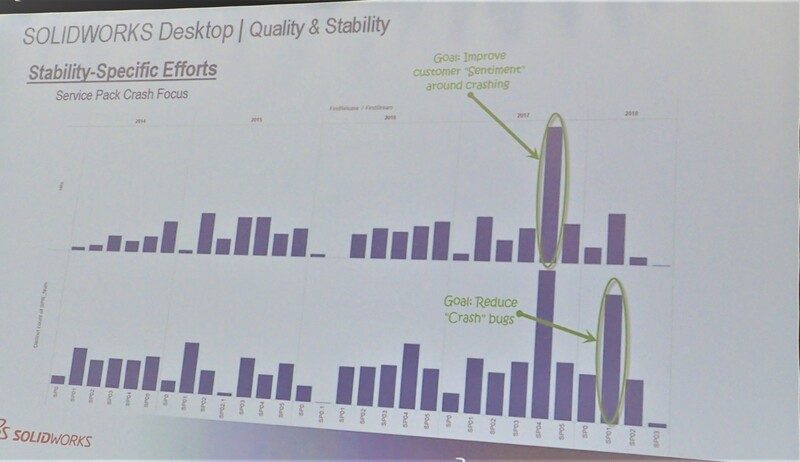 John produced a range of data showing how they have used re-architecture over the years to reduce issues with various components of the product and the positive effect that it has had. 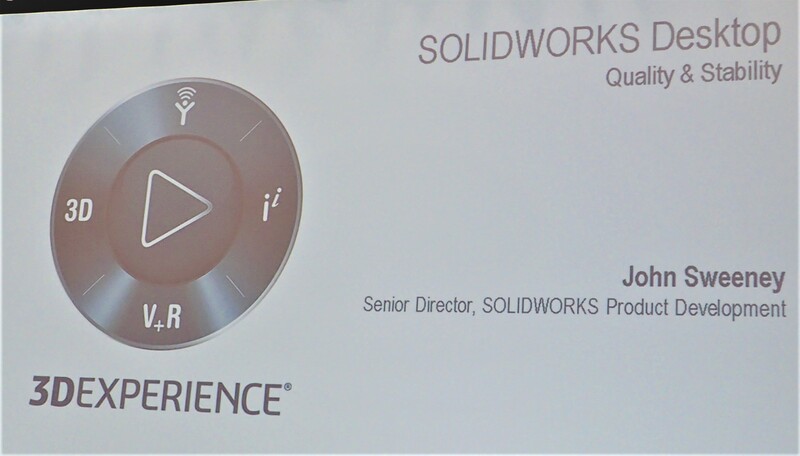 John reiterated from last year about maintaining the Zero Tolerance policy for coding of all new SOLIDWORKS features. 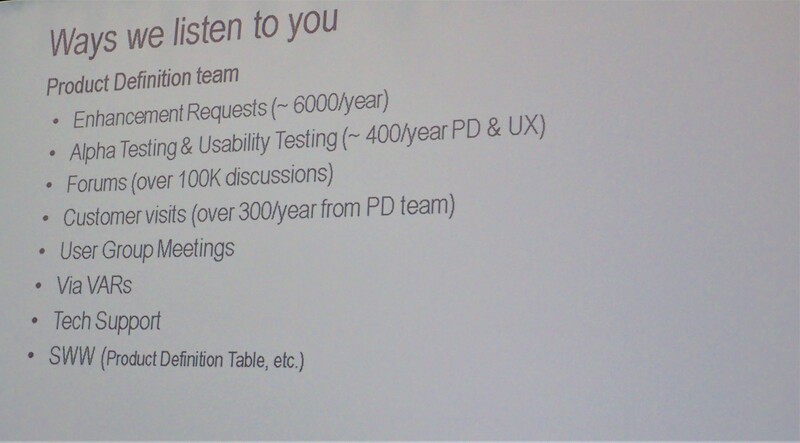 Something they are also going to work towards, with their partners. 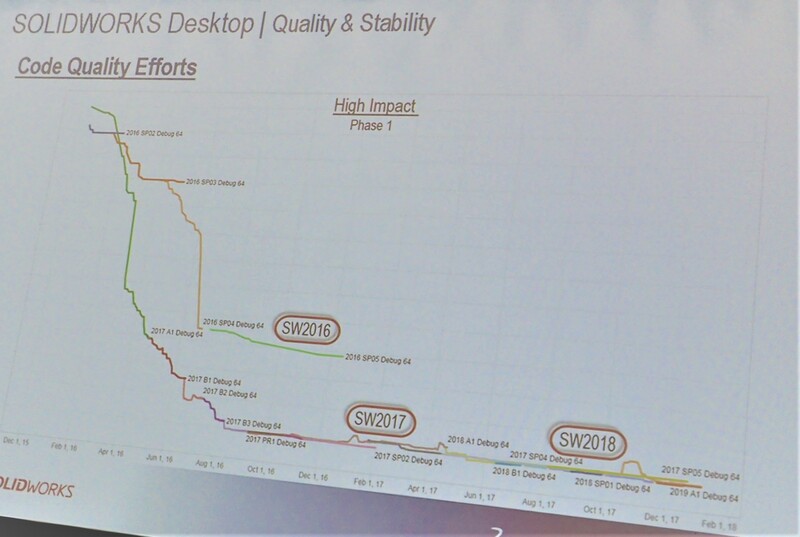 John showed a range of graphics on the tracking of the crash data and how it is used to help diagnose the cause of the crash or termination. 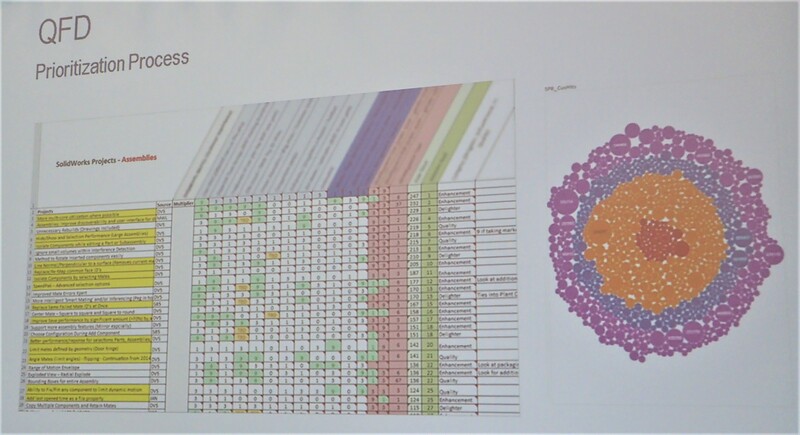 He highlighted at times that what appears to be unrelated events could be traced to a convergent point. An example of this is the simple task of opening a part. How difficult is it to open a part? 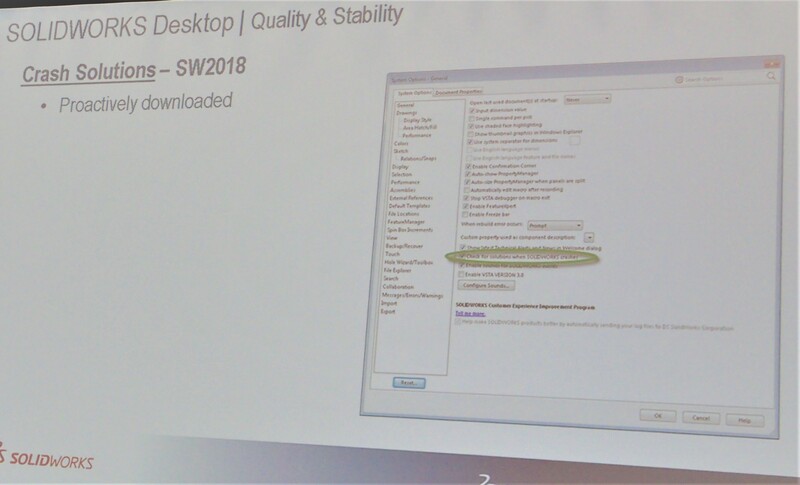 You would think it’s a straight forward thing, Less so when you ask the question, how many different ways are there to open a part in SOLIDWORKS? 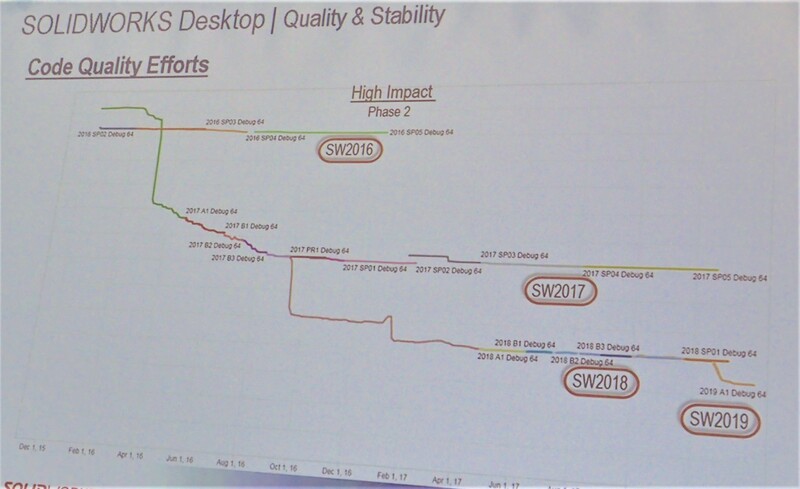 There was discussion in regards to providing feedback from crashes starting with SOLIDWORKS 2018. 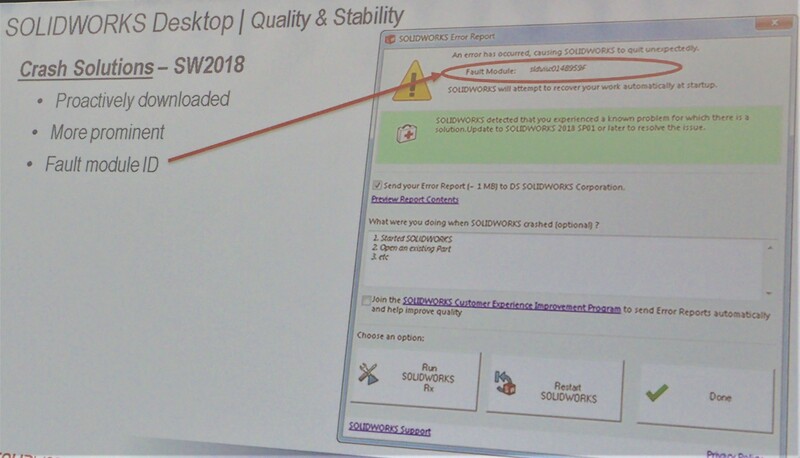 The Error Report for SOLIDWORKS 2018 will display a fault module identification for similar reported crashes. 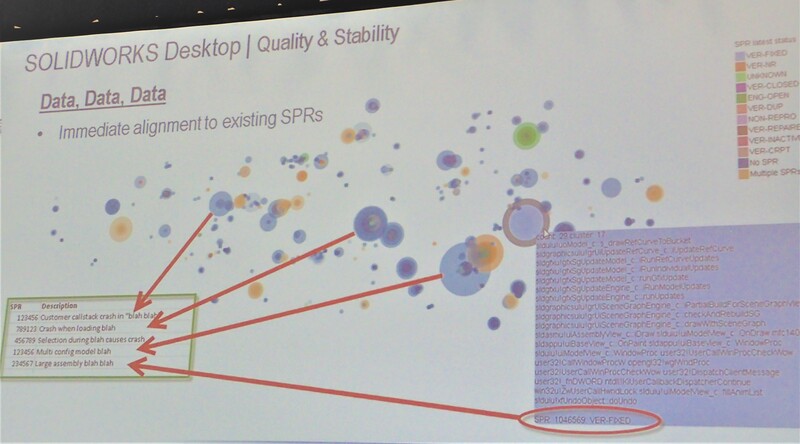 Along with the ability to show a resolution to a known problem. 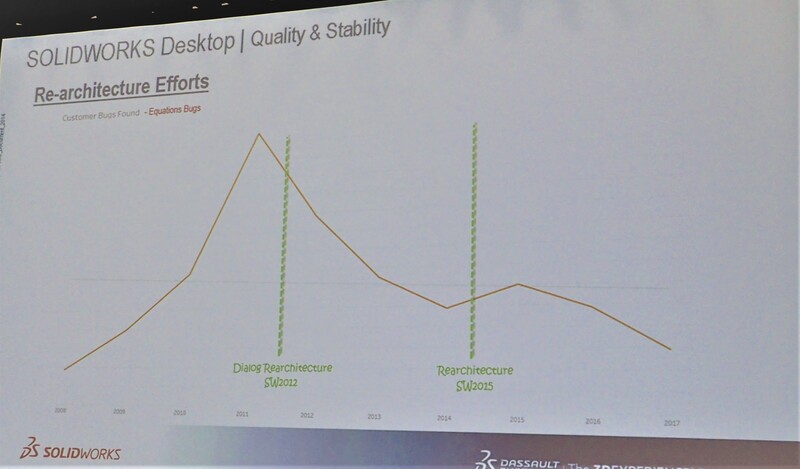 Gian Paolo Bassi – CEO – Dassault Systemes SOLIDWORKS, spoke briefly. 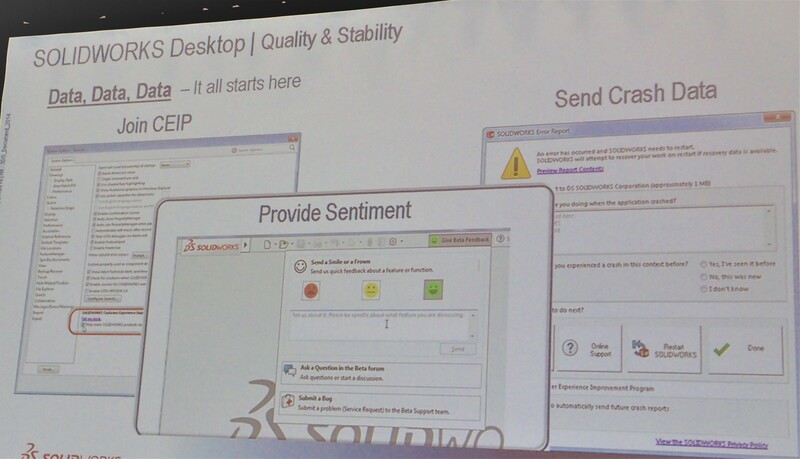 He started “I’m here for the tomatoes” a light heart sentiment but an acknowledgement that there was still work to be done, to fully restore the faith to some in the SOLIDWORKS community. 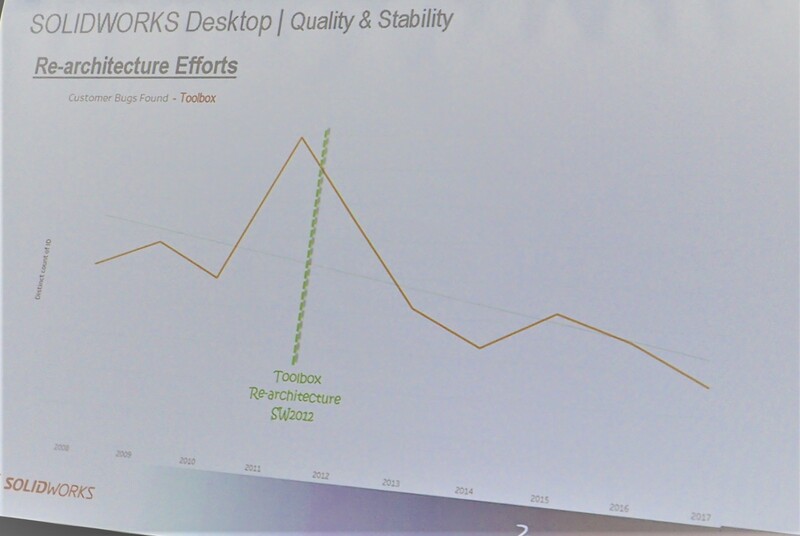 In the past you might have thought that there was some irony in a photo of the CEO with a cap to his side, which made reference to problems in their software. The way they have embraced the issue that is not the case. 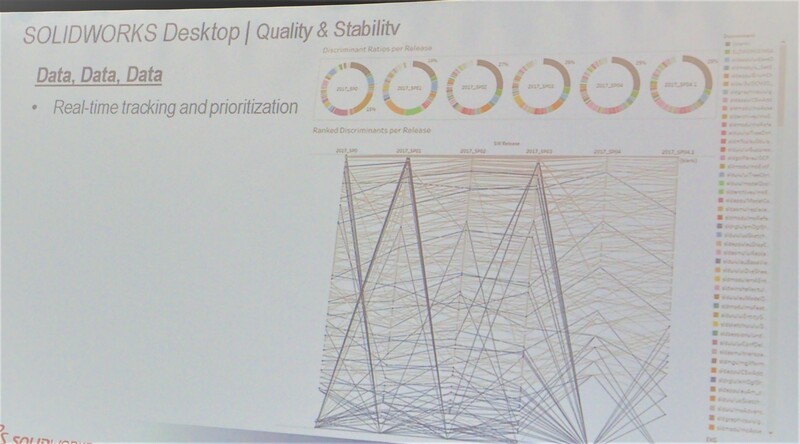 Once more Gian Paolo gave support and full backing to what had been presented. 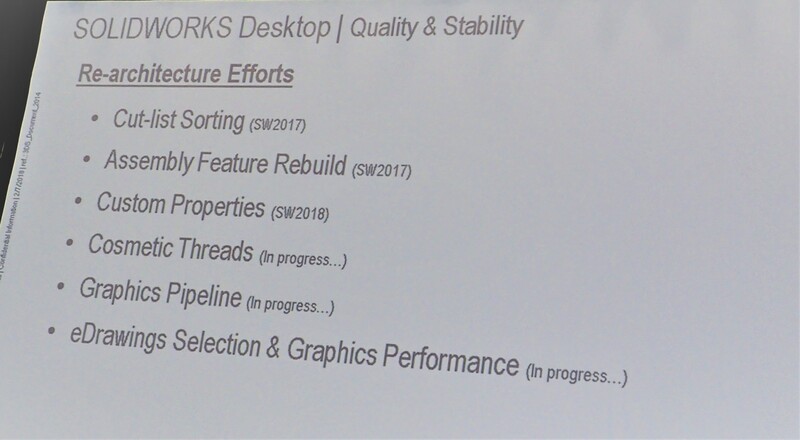 He again gave very strong commitments to ensure that they are working on the quality of the product to produce a better and more stable desktop SOLIDWORKS application. 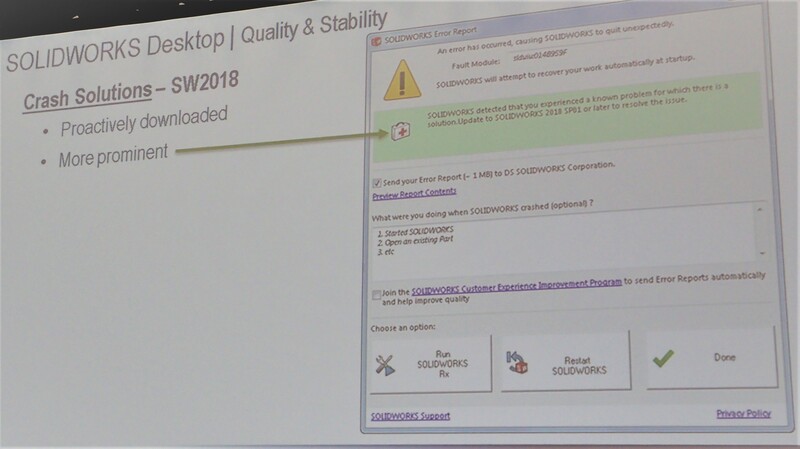 John finished with what appeared to be an impromptu question asking if anyone has a consistent issue with the SOLIDWORKS Resource Monitor showing the “System Memory is Critically Low” warning. 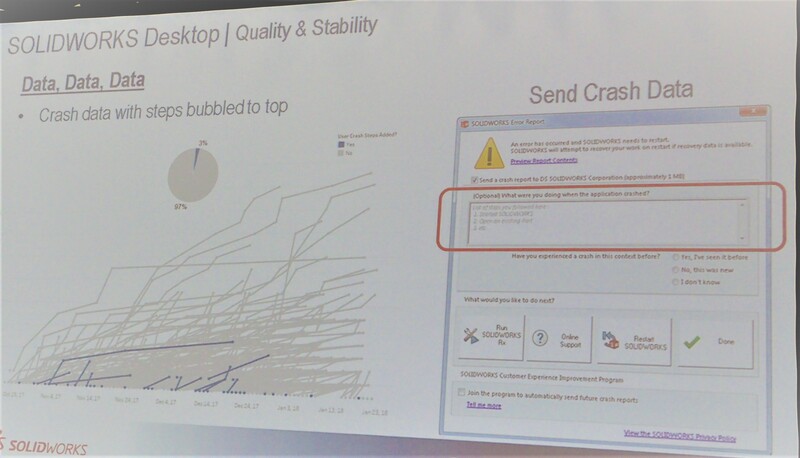 I’ve never experience the issue but I know of it. 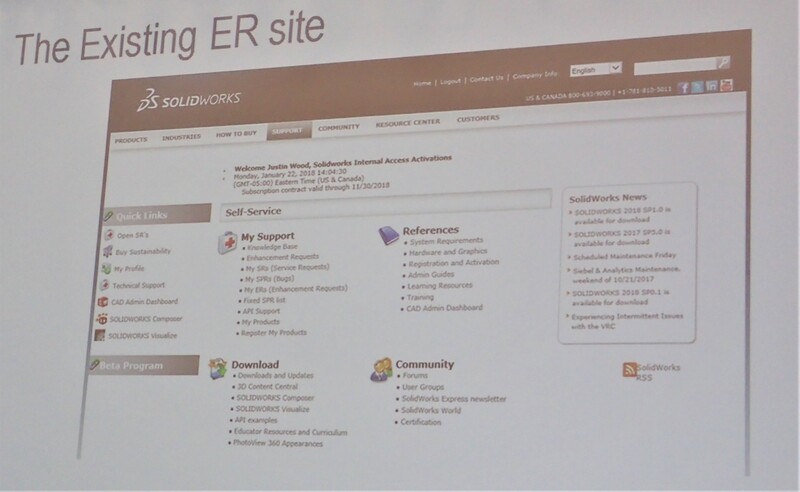 SOLIDWORKS has an article on it. 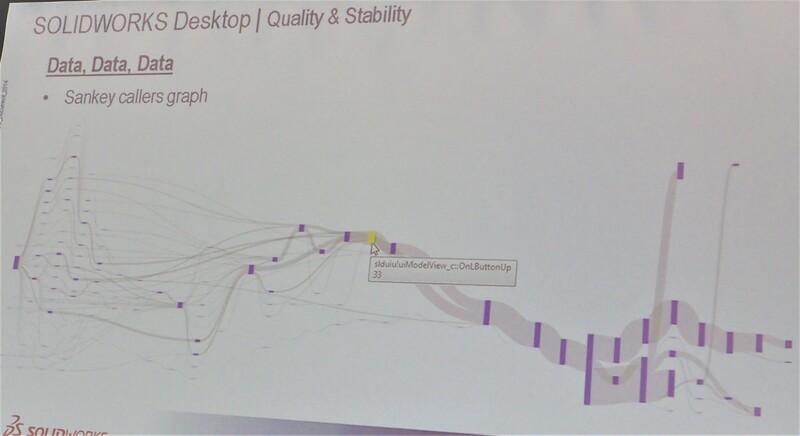 It appears to be very random and looks to be one of those Windows – SOLIDWORKS conflicts! 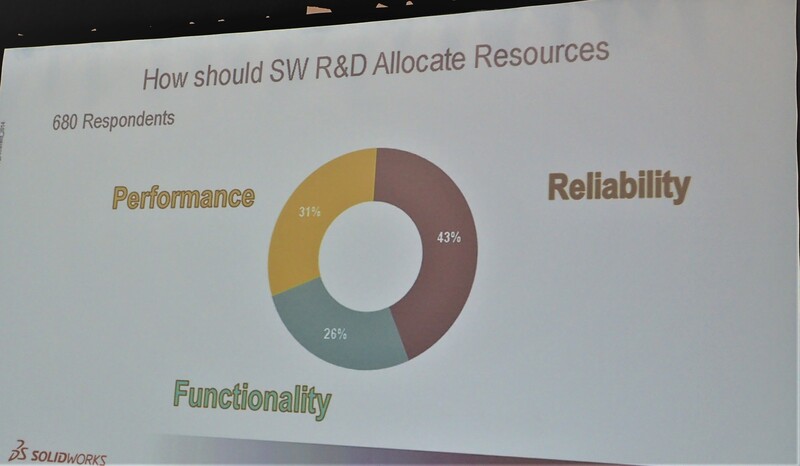 If it effects you and is repeatable Dassault Systemes SOLIDWORKS R&D would like to hear from you. 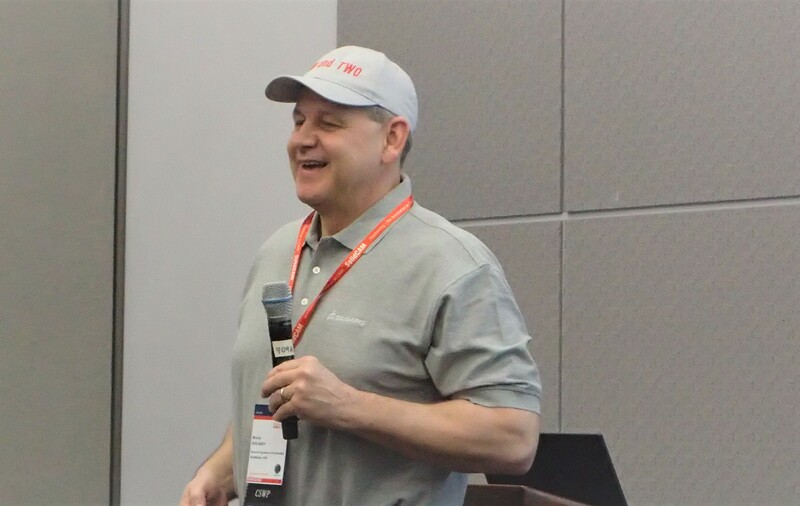 Using a Breakout Session for the Top Ten at SOLIDWORKS World has allowed Dassault Systemes SOLIDWORKS to show a more human side of it’s self. Not just the corporate giant. 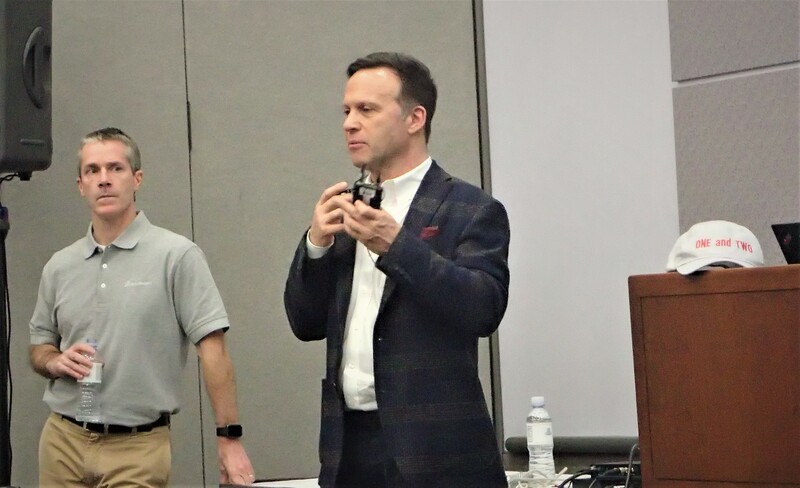 It allows some of the very good people who work there, a opportunity to provide greater information, and to enter into open & honest discussion. And that, can never be a bad thing!